Madhusoodhan, a native of Tippagondanahalli, was married to C S Madhusoodhan and was brought to Shankar Nagar at a very young age. She inherited the love for the garden from her father-in-law, who had a soothing variety of trees in the courtyard. “My father-in-law built this house and planted a thamala in front of the house. Ever since, people began to identify our house with the tree. I have tried to continue his legacy by allowing the trees to grow in the garden,” says the veteran gardener, looking at a strong foliage in front of the house. Her garden contains five trees which she allowed to grow and a variety of roses and therapeutic plants whose fragrance elevate your soul to a different level. Madhusoodhan had won residents’ association awards for homely gardens and flowering. Besides being a gardener, she was a also a cricketer, badminton player and a sprinter. Enjoying a quiet life with her son M Thilak in Shankar Matt, the nature lover is an encyclopedia of therapeutic plants and leafs. The neighbours are the immediate beneficiaries of her love for the nature. They are thankful to her contribution for the past 25 years in keeping the neighborhood clean and refreshing. “Our neighbourhood is grateful to Madhusoodhan for her love for the garden. 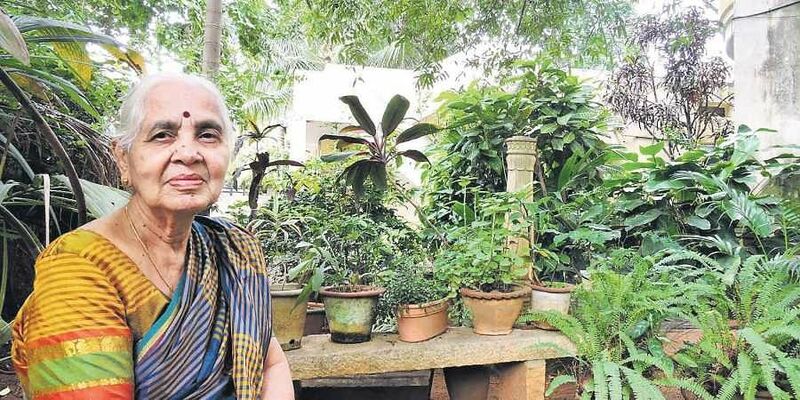 It has helped us with fresh air and we don’t want to vacate the house because of this greenery,” says Kamalakumari, her immediate neighbour.